When it comes to refugee and migration policy, the European Union has a knack for inventing pseudo-English terms. Itʼs highly unlikely that doublespeak will provide a breakthrough. When Europe’s heads of government staggered bleary-eyed out of a Council meeting on the morning of June 29th, it looked as if they had broken the migration policy deadlock. Angela Merkel had the result she needed to keep her government together and calm her sister party, the Bavarian CSU. The new Italian prime minister, Giuseppe Conte, was also pleased– he had gotten promises of support from the rest of Europe with the migrants landing on his country’s Mediterranean coastline, and Italy was now “no longer alone.” With the ostensible breakthrough emerged a new term: “regional disembarkation platforms.” But what exactly was Brussels’ new baby? Got it? OK, there’s more detail to come. But it’s notable that the EU fact sheet does not contain a sentence that plainly states what the disembarkation platforms are. No subject and predicate linked by a copula, not even an “appear” or “will become.” But remember, they are emphatically not camps. This, though, is not just an example of obfuscatory bureaucrat speak, of which the EU is a master in English, run as it is by highly educated officials who often speak excellent English as a second or third or fourth language, peppering their statements with words like “informations” and “feedbacks” that are foreign to a native. The problem is that it’s very difficult to be clear about a concept that must be all things to all people. Some parts about disembarkation platforms are somewhat clear. The core idea is to set up safe centers for processing asylum claims outside of EU borders, probably in safe countries in North Africa. This would “eliminate the incentive to embark on perilous journeys” across the sea in order to have the right to file an asylum claim. It would also help stop people smugglers, a noble goal. If a migrant at sea is rescued by a third-country vessel or by an EU vessel in international waters, he or she could be brought to one of the platforms. Those people not entitled to international protection should “be returned,” while those in need of protection could be resettled, though not all of them would get to go to Europe. In order to entice African countries to sign up, the EU will offer money, training, administrative support, and legal resettlement places. This is not a new concept. European leaders have long floated similar plans. At the restrictive end of the spectrum, Sebastian Kurz of Austria has pushed for “safe zones” in refugees’ countries of origin, which the EU would support “militarily.” Indeed, the 2016 EU agreement with Turkey is based on the principle of a third country processing migrants and preventing so-called irregular migration in exchange for EU aid and concessions. All such ideas are part of the EU’s push to externalize the migration problem by getting other countries to take more responsibility for people crossing their borders, which also defuses the issue politically and minimizes the EU’s legal responsibility by reducing contact with migrants. Europe’s partners, though, quickly made clear how difficult it would be to implement “disembarkation platforms.” The UN Refugee Agency reportedly wrote a confidential letter insisting that any centers in third countries be “safe and dignified,” a tall order in, for example, key transit country Libya given the deplorable conditions and slave markets there. African heads of state responded by agreeing to reject Europe’s “easy, counterproductive solution,” as Morocco described it. According to recent reports, there is still no African country prepared to operate a platform. No government is eager to be fully responsible for the centers, or risk having rejected asylum-seekers disappear into its territory. Migration experts agreed that the idea was fanciful. Catherine Woollard of the European Council on Refugees and Exiles accused the EU of living in “externalization fantasyland,” of relying on countries taking back their citizens when they are unwilling or unable to do so. To a developing country, remittances from citizens working in Europe are often more valuable than extra foreign aid; and sometimes these countries are wary of reaccepting emigrants for whom they couldn’t provide jobs or services in the first place. 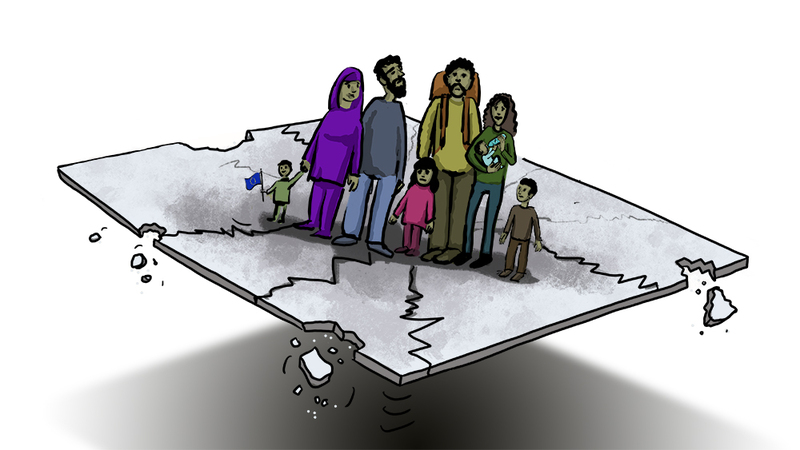 Europe also offers too few legal resettlement places to really discourage illegal migration, as Elizabeth Collett and Susan Fratzke of the Migration Policy Institute point out. In March 2018, the UN had to temporarily suspend a program whereby refugees were flown from Libya to Niger for processing because the EU had only resettled a fraction of the already small number promised. The EU’s first scheme to force member states to take in refugees from Italy and Greece already collapsed when the Visegrad countries revolted. And cooperation has hardly improved since the June summit: in August, the Italian government refused for six days to allow a boat of Eritrean migrants to disembark in Sicily until Ireland finally agreed to take some in. It’s easy to snipe from the sidelines. Illegal migration to Europe is an intractable problem that is only likely to get bigger, at least from the perspective of Europe’s politicians. And the announcement from Brussels that the EU had agreed on a migration solution was certainly a boon to Merkel and Conte. Just don’t expect “disembarkation platforms” to be the breakthrough for European migration policy, or the next new name for refugee centers to be much more than window dressing. Unless North Africa has a change of heart, the only relevant platforms will be the piers where people get off boats. is an editor at Berlin Policy Journal.